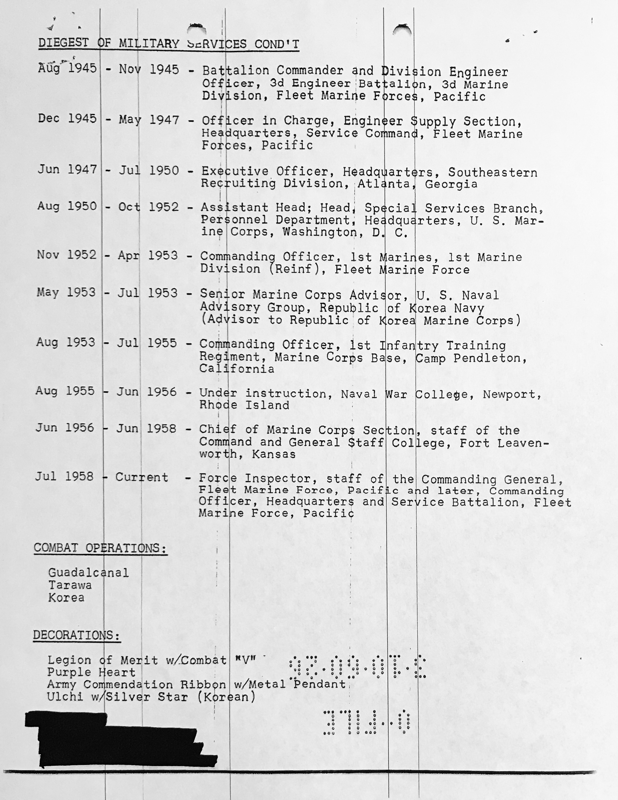 United States Marine Corps Colonel Hewitt “Sparky” Dayne Adams (service #05562) was born July 8th 1914 in Rochelle, Texas. 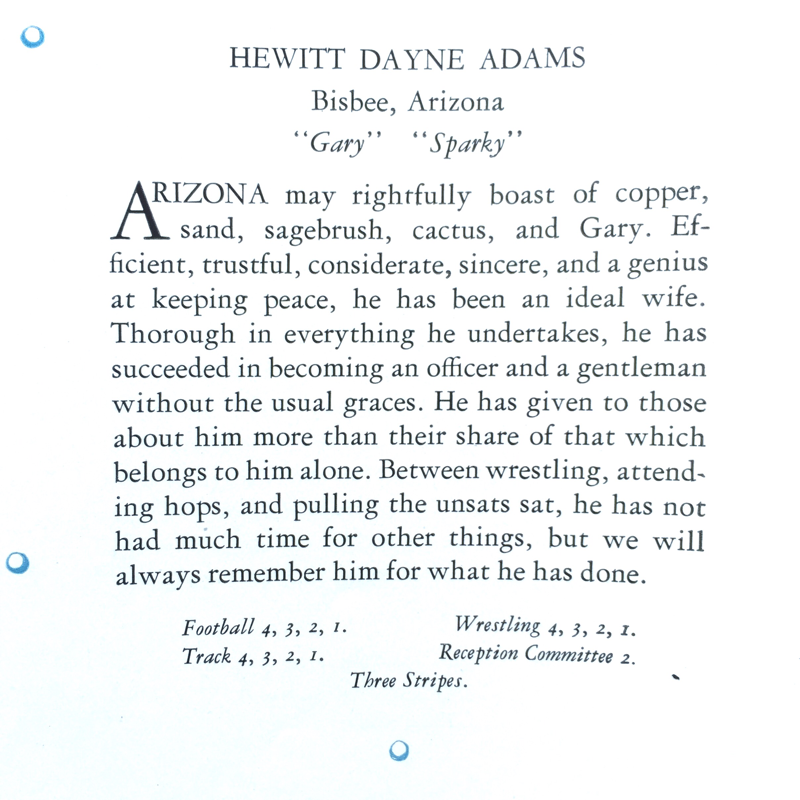 Hewitt moved to Arizona as a boy & he graduated high school in Bisbee, AZ. 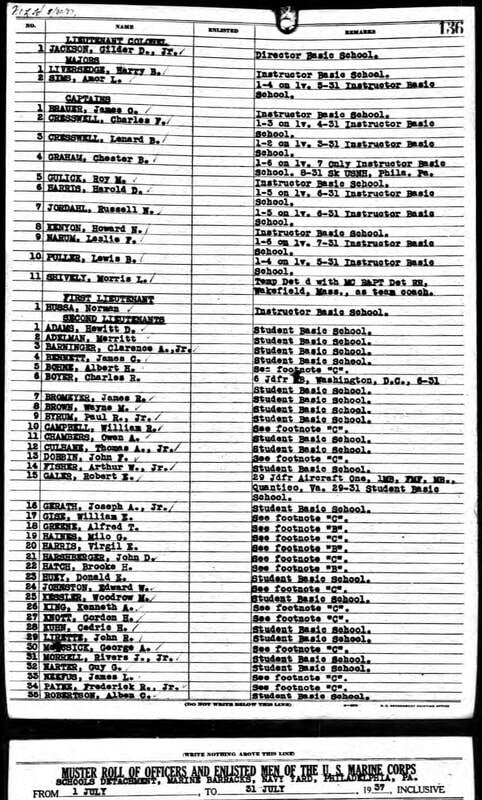 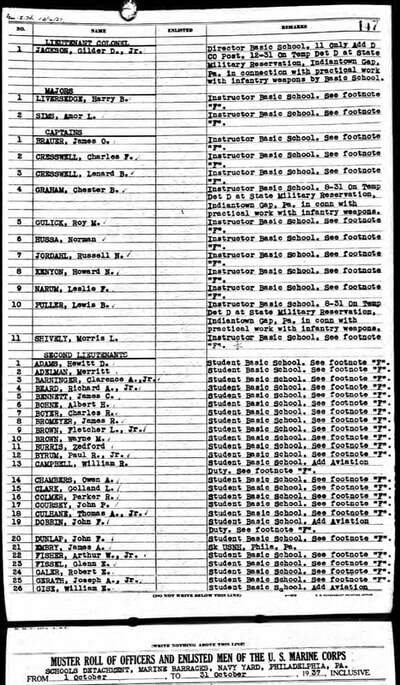 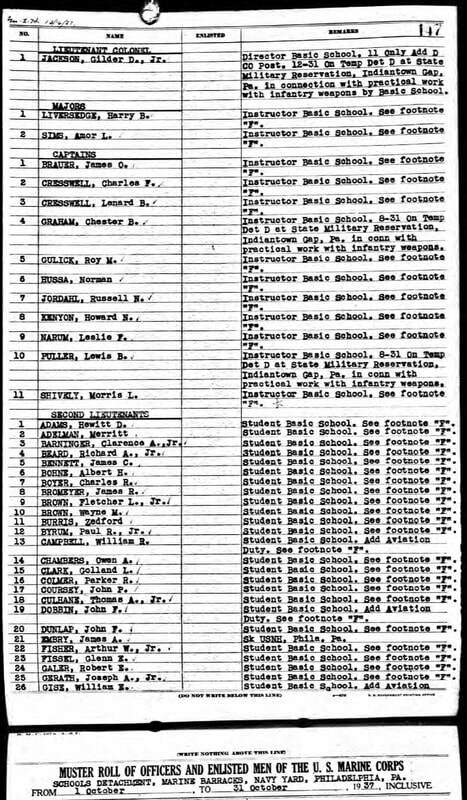 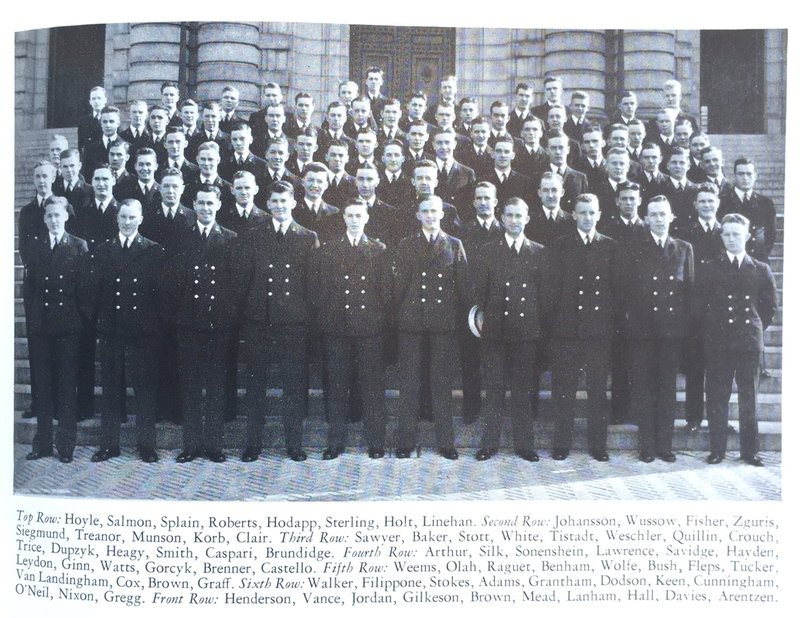 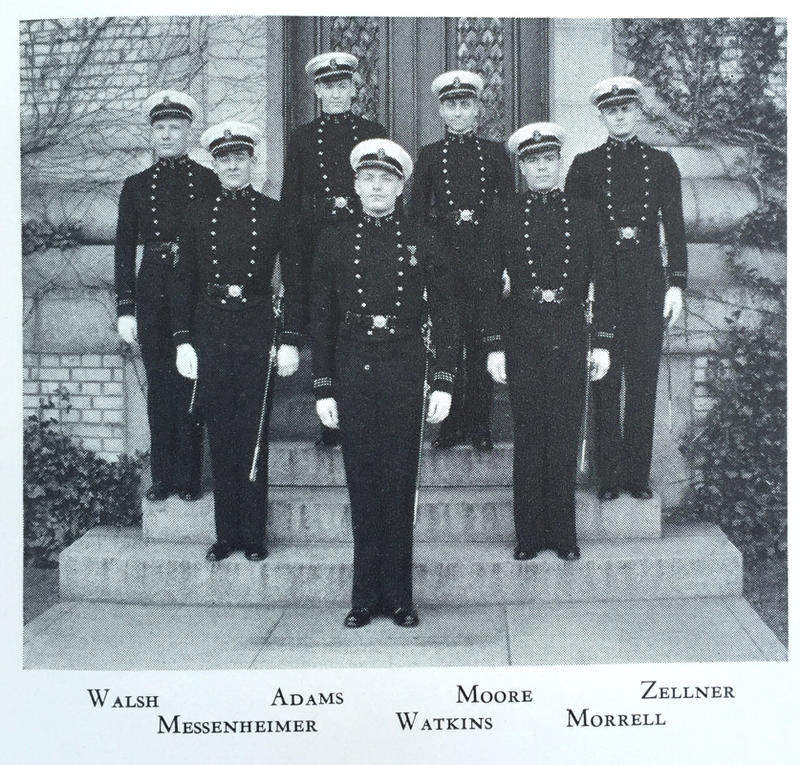 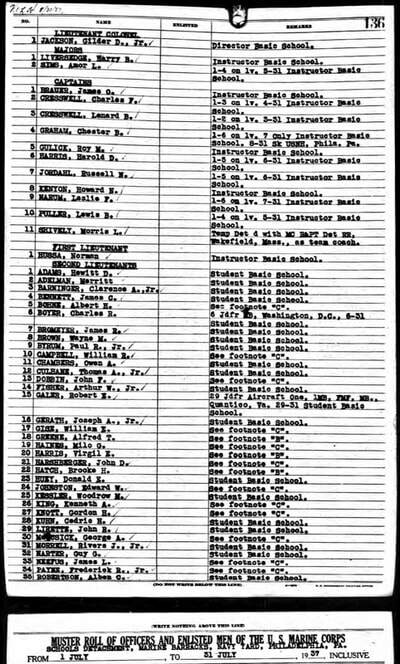 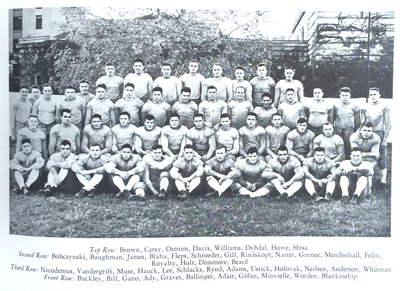 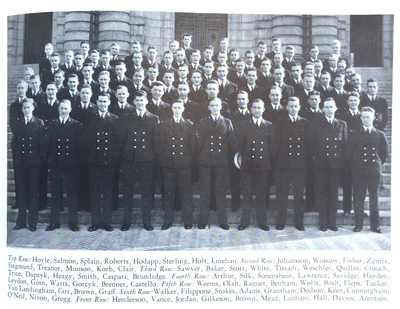 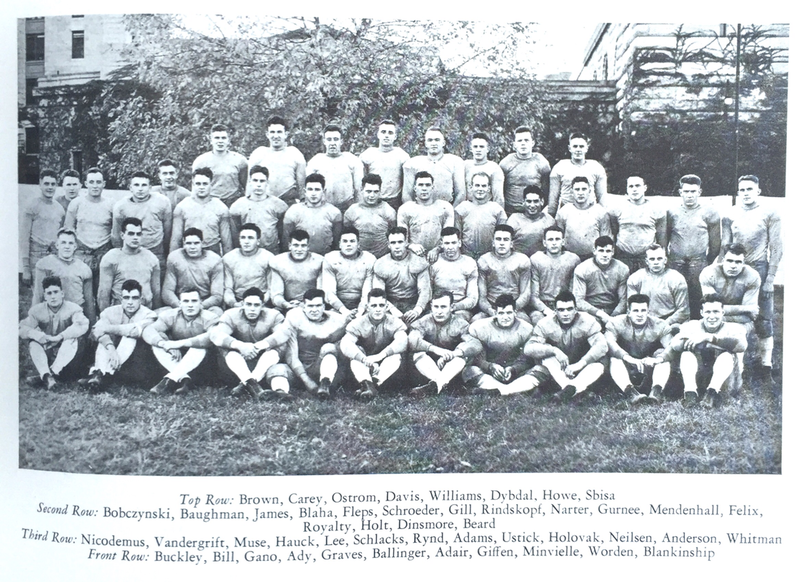 Midshipman Adams graduated with the 1st class of 1937, 3rd Battalion. 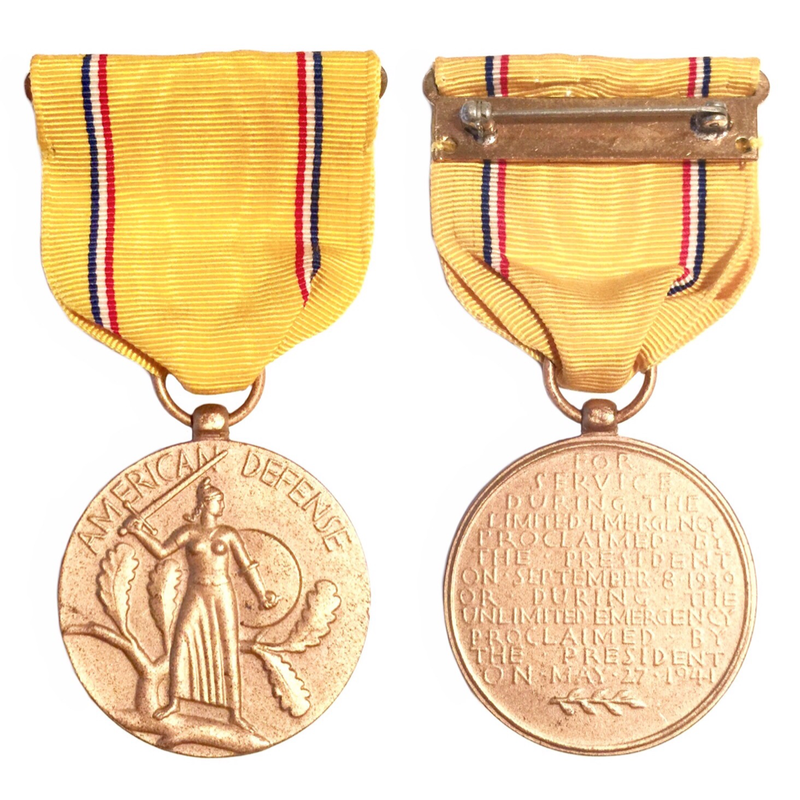 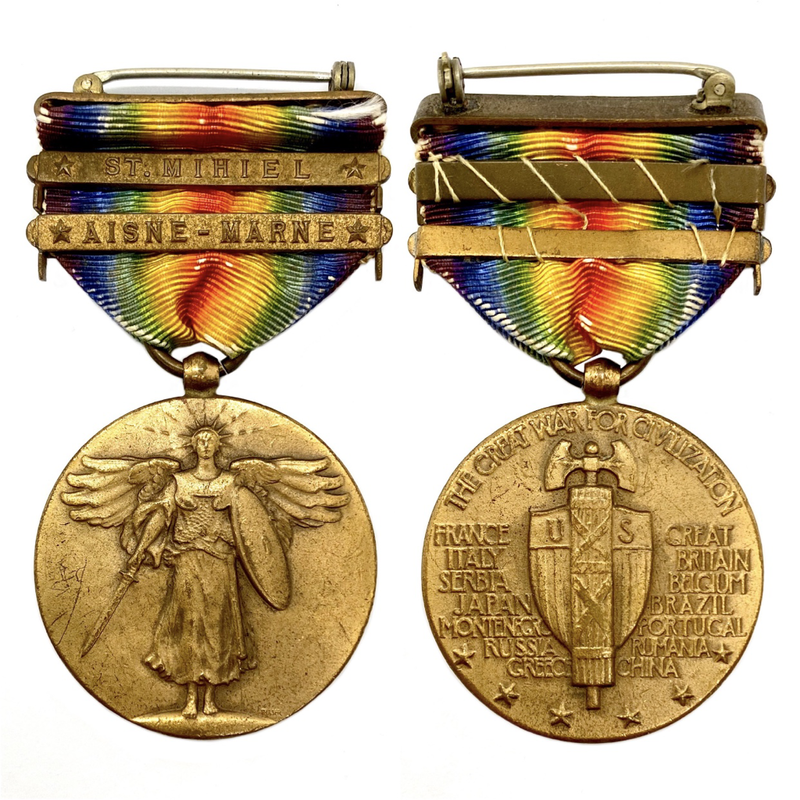 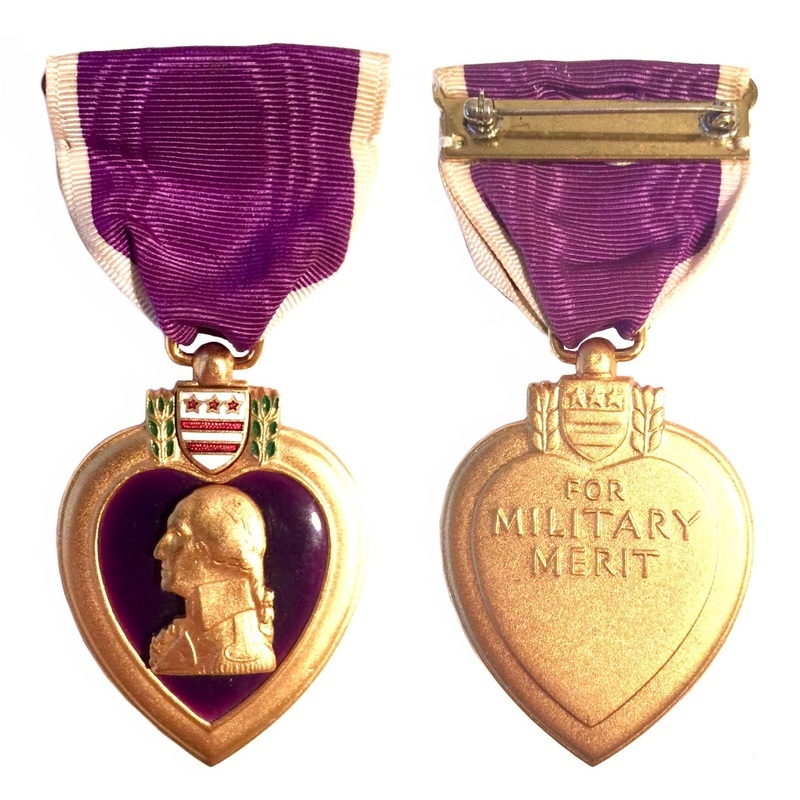 Earning the coveted Marine Corps Eagle Globe Anchor & commissioned a 2nd Lieutenant. 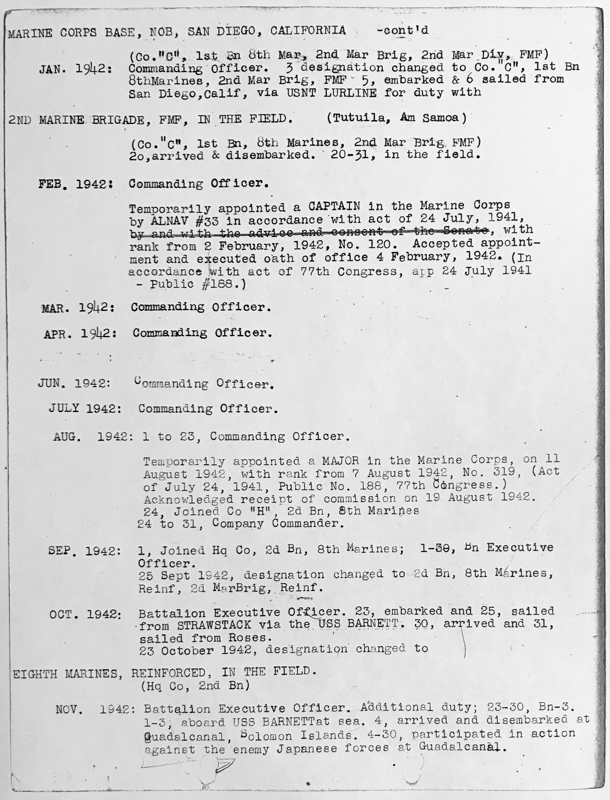 2nd Lt. Adams was transferred to the Marine. 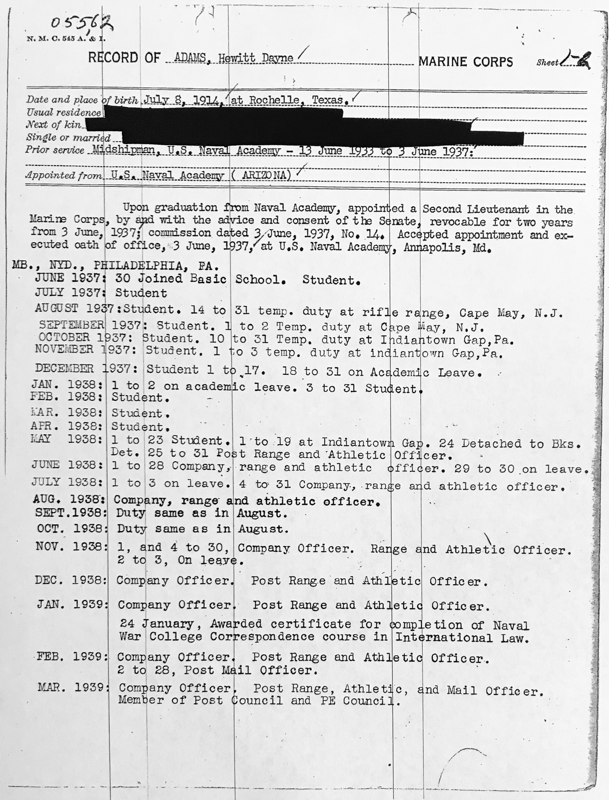 Barracks, Navy Yard, League Island, Pennsylvania in June 1937 where he remained stationed until Aug. 1938. 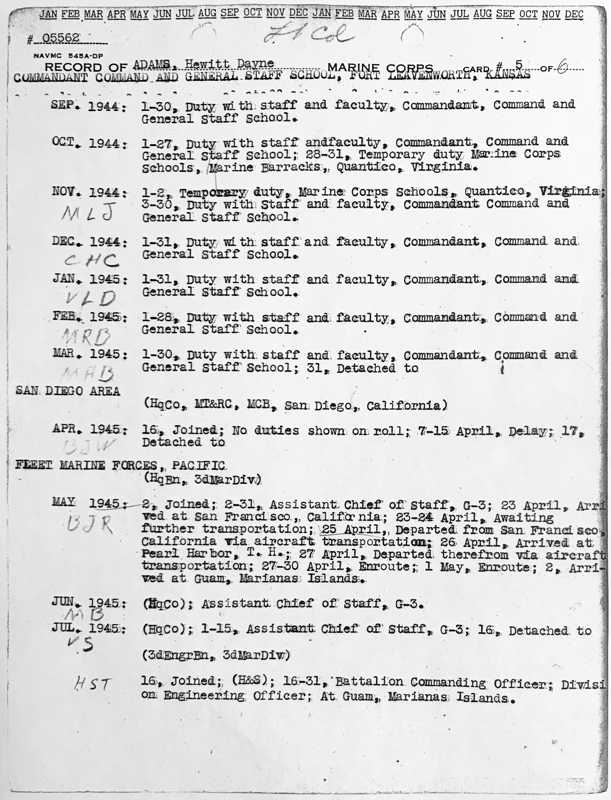 He trained at Naval Air Station, Pensacola FL., Naval Torpedo Station, Keynote Washington, & the Rifle Range Detachment, at Quantico, Virginia from Sept 1938 through June 1939. 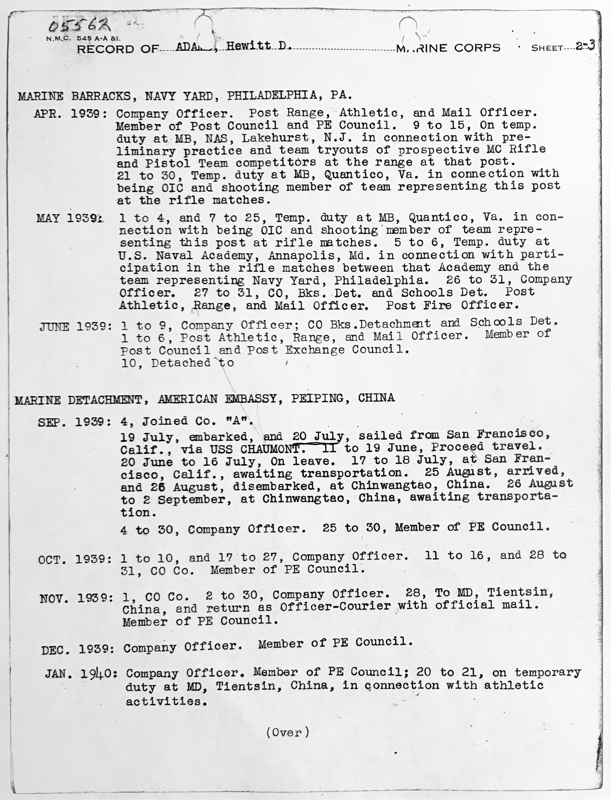 2nd Lt. Adams arrived in China on Aug. 26th 1939, serving with the Headquarters Marine Detachment, Co. A, American Embassy, Peiping China. 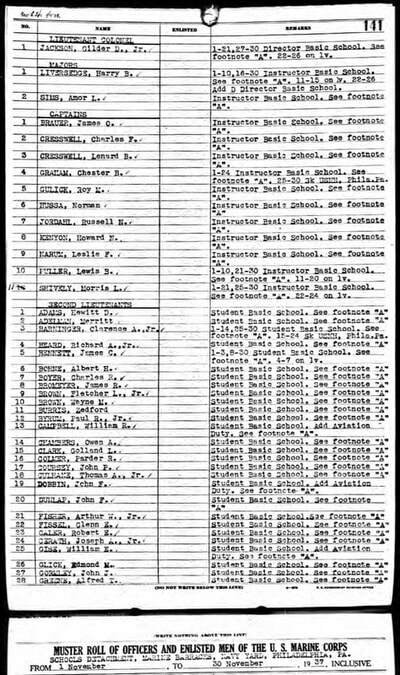 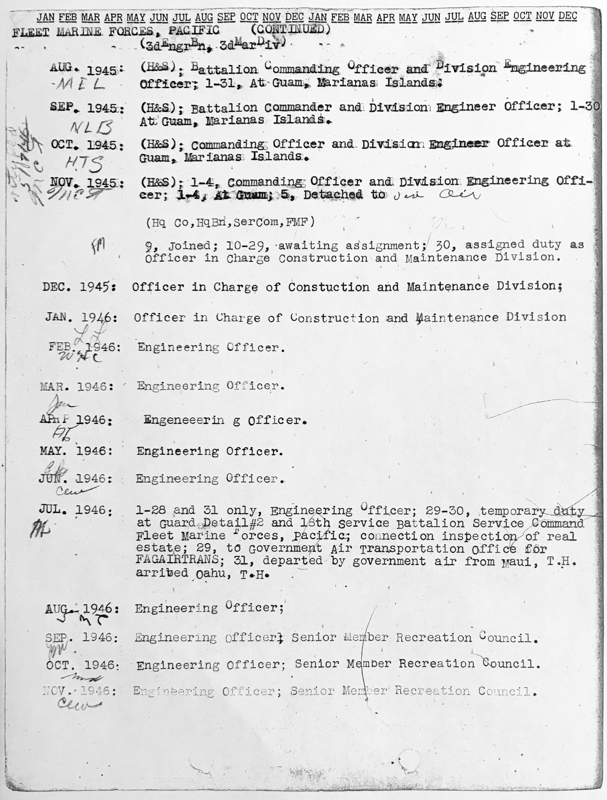 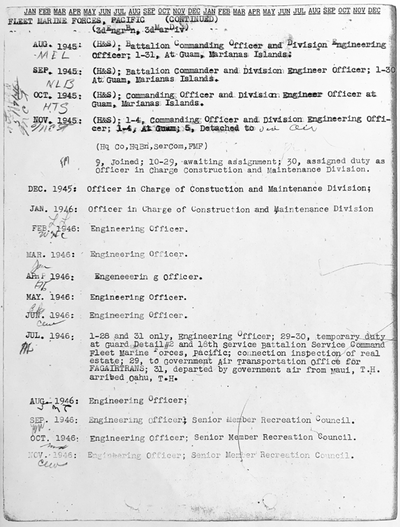 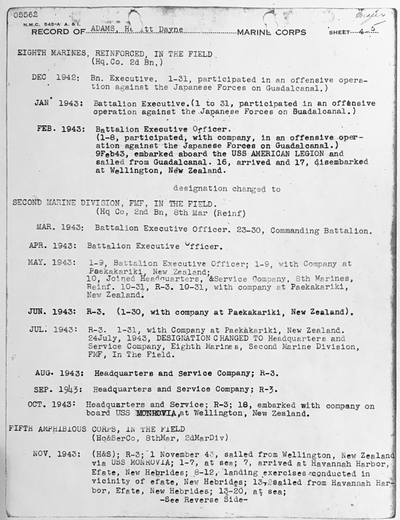 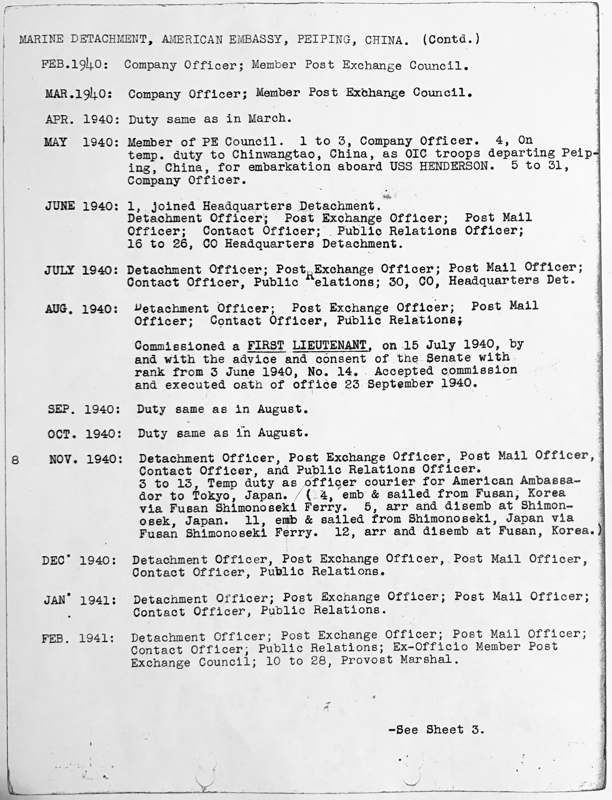 Where was promoted to 1st Lieutenant in Aug. 1940. 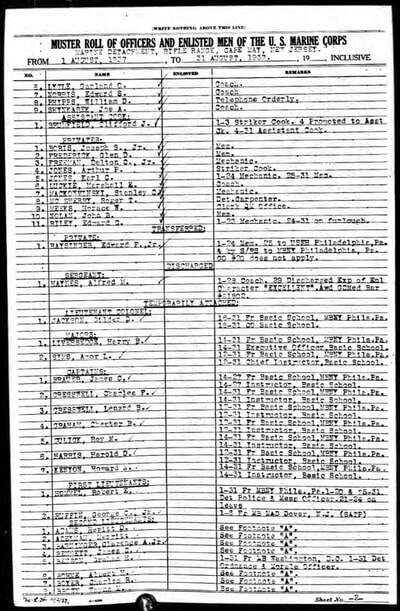 1st Lt. Adams served at the Embassy for over a year until Sept. 1940. 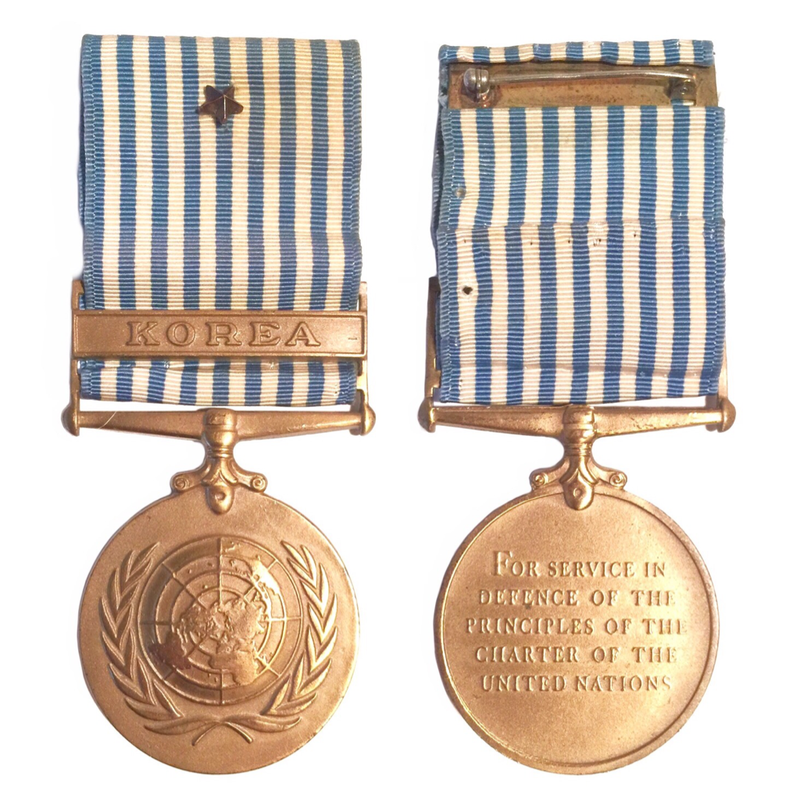 For this service he was issued China Service Medal #943. 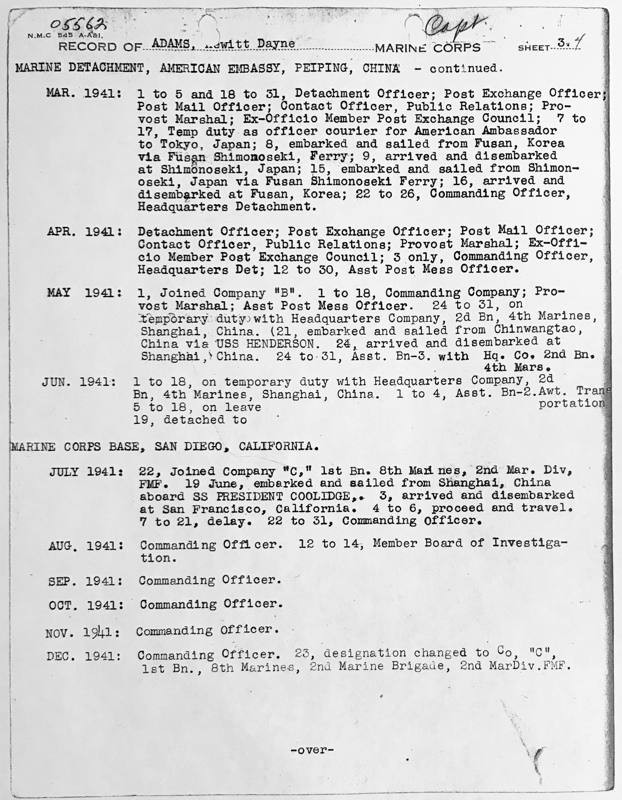 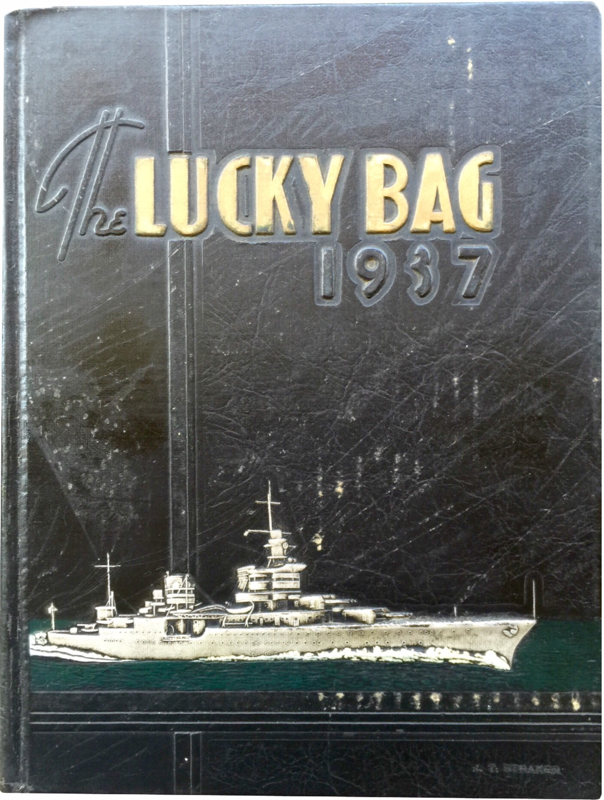 1st Lt. Adams was temporarily stationed at Naval Air Station, Pearl Harbor from Oct. 1940 through around Dec. 1940 before being transferred back to the American Embassy, Peiping China. 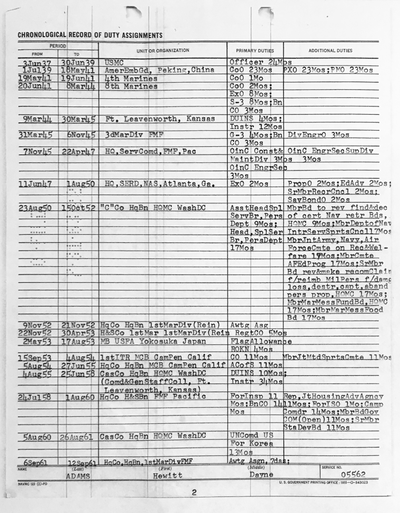 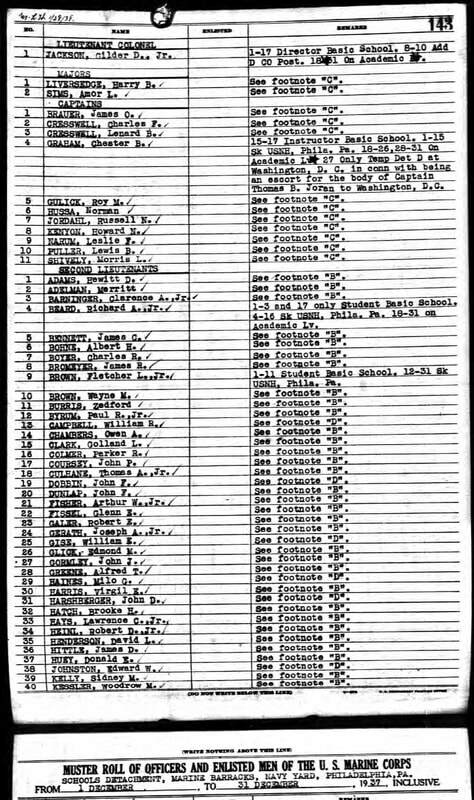 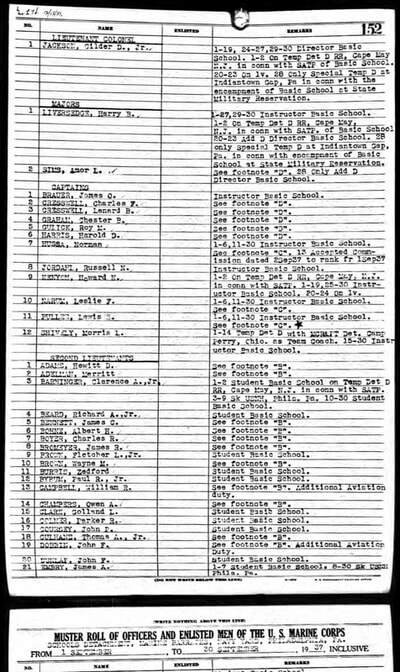 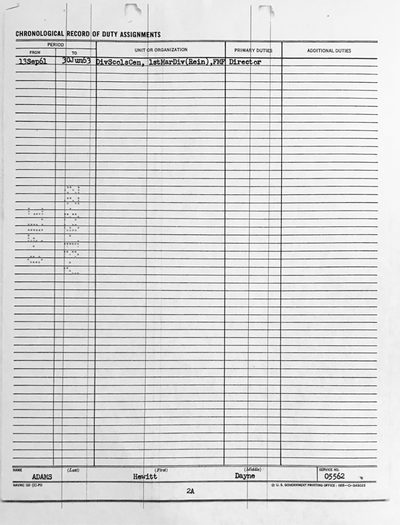 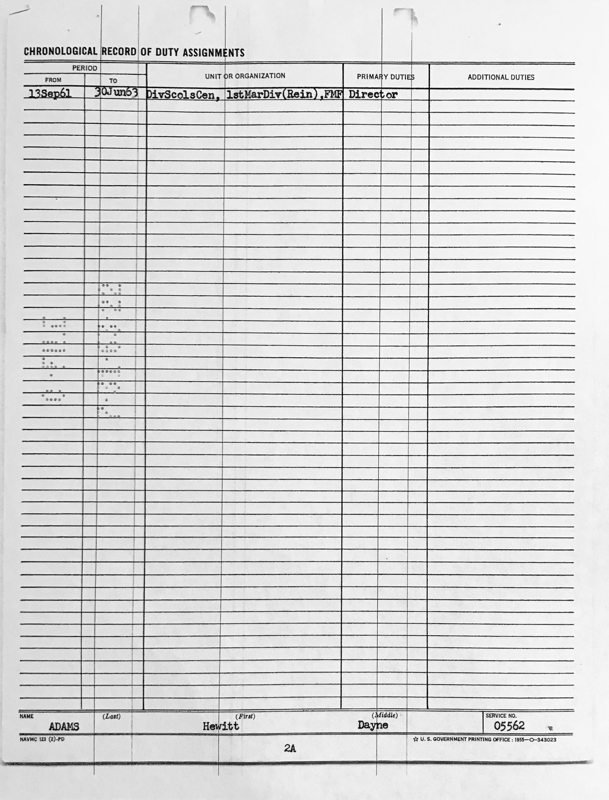 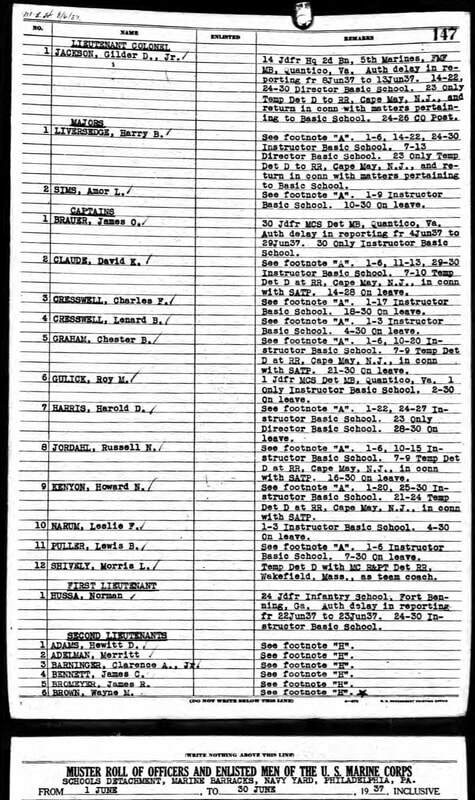 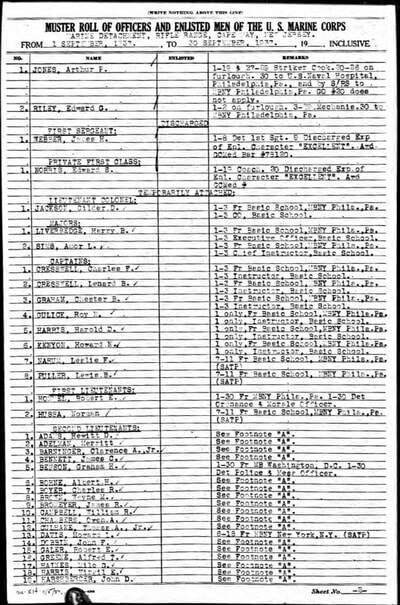 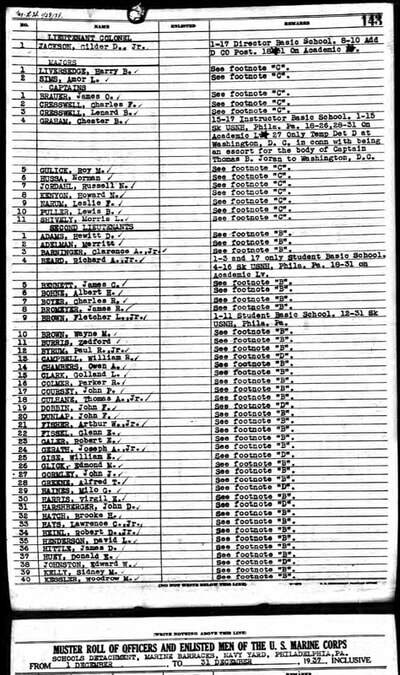 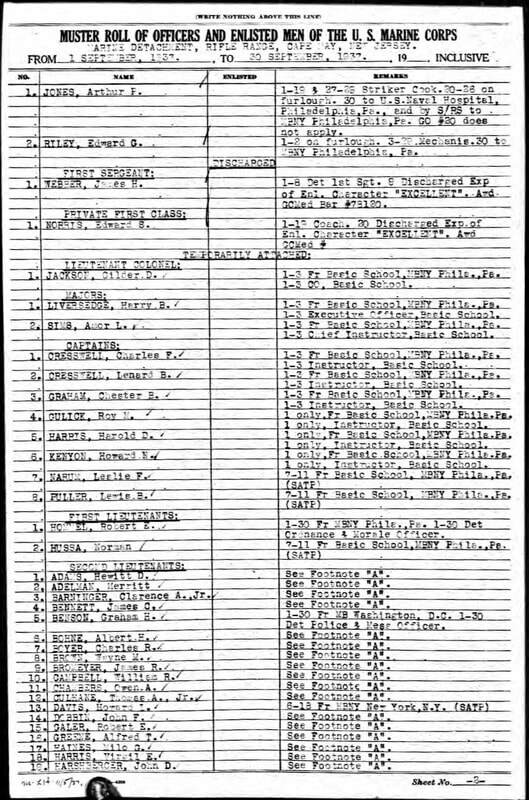 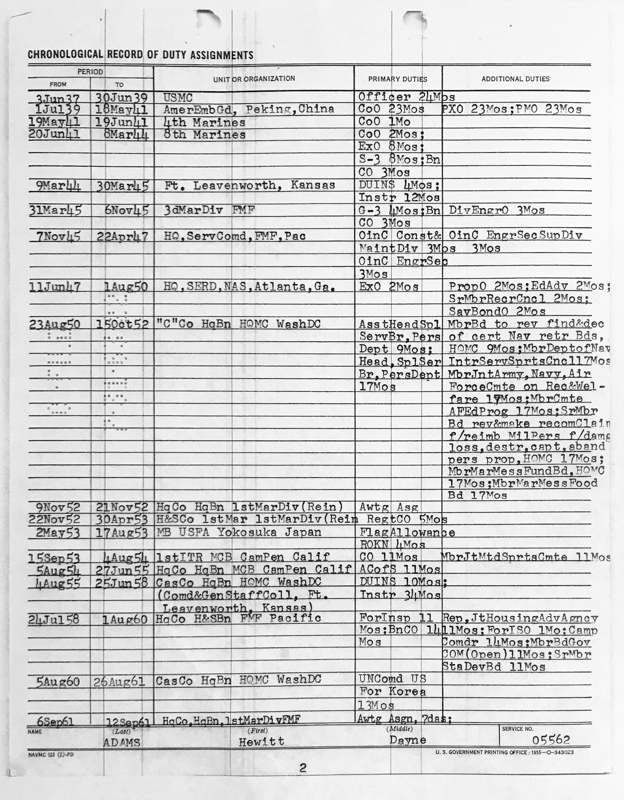 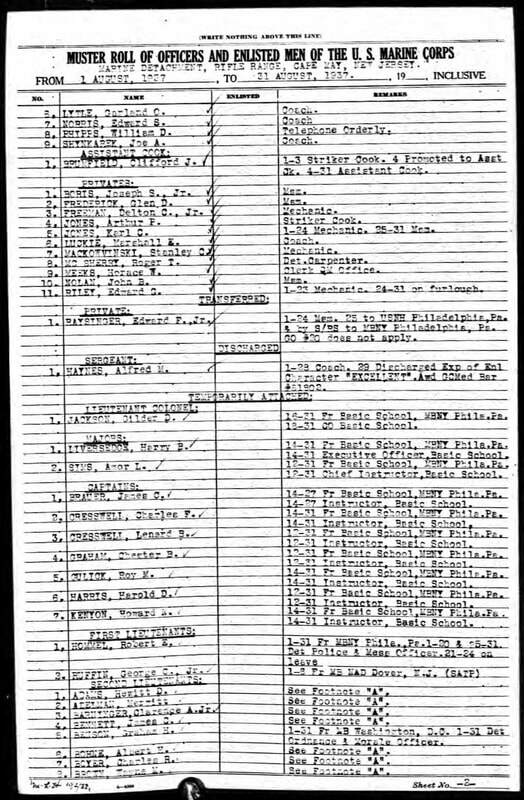 Prior to the outbreak of World War II 1st Lt. Adams was transferred to Co. C. 1st Battalion, 8th Marines, 2nd Marine Division, Fleet Marine Force, San Diego, California in Oct. 1941, & by Jan 1942 1st Lt. Adams was in the field Island hopping his way towards the Battle of Guadalcanal where he served as the Executive Officer of the 2nd Battalion, 8th Regiment, 2nd Marine Division. 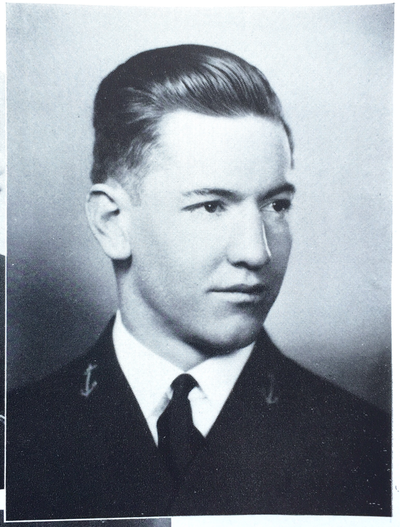 Born 8 July 1914 in Rochelle, TX. 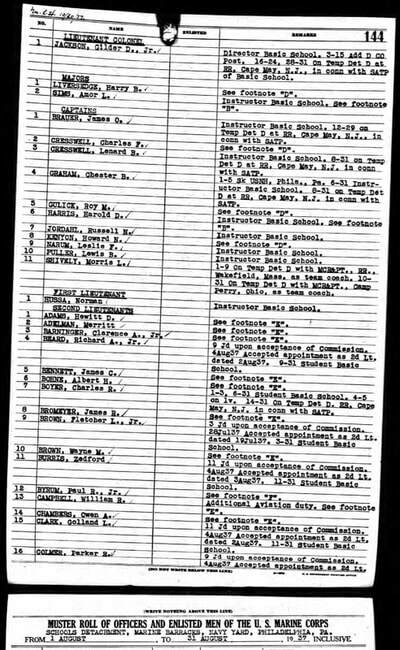 Gradated H.S. 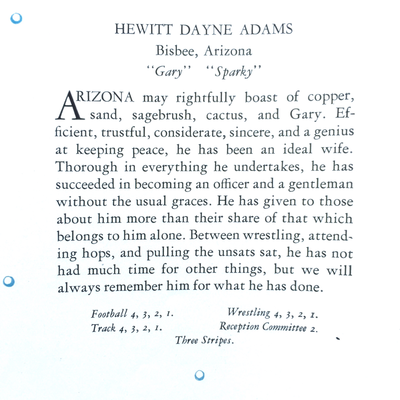 in Bisbee, AZ. 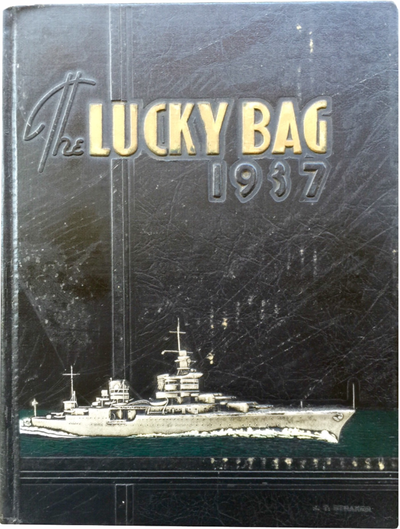 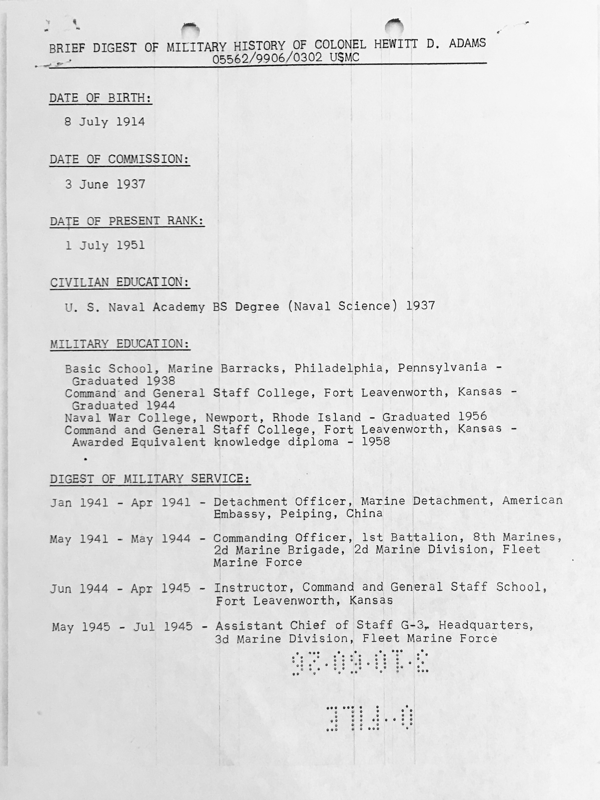 Graduated the United States Naval Academy in 1937 and commissioned a Second Lieutenant in the US Marine Corps. 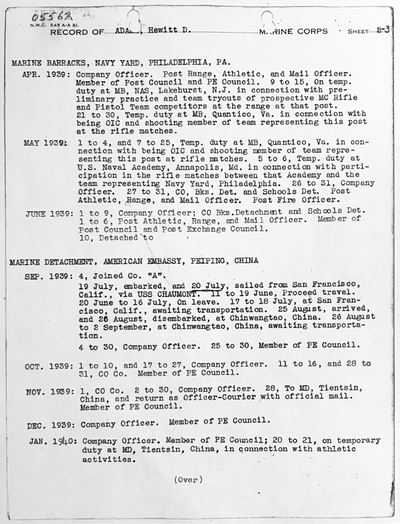 After completing his officer training, 2LT Adams was assigned to the US Embassy in Peking, China. 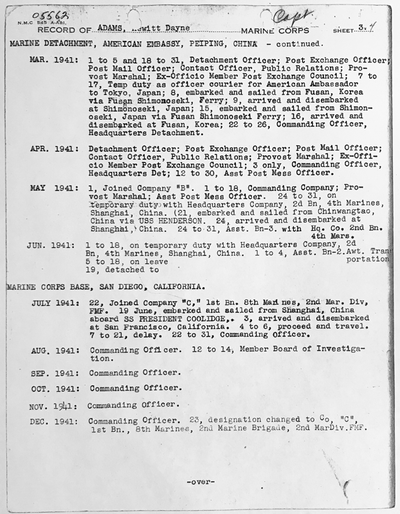 Arriving on 26 August 1939, he served in several Marine units in China until his return on 19 June 1941. 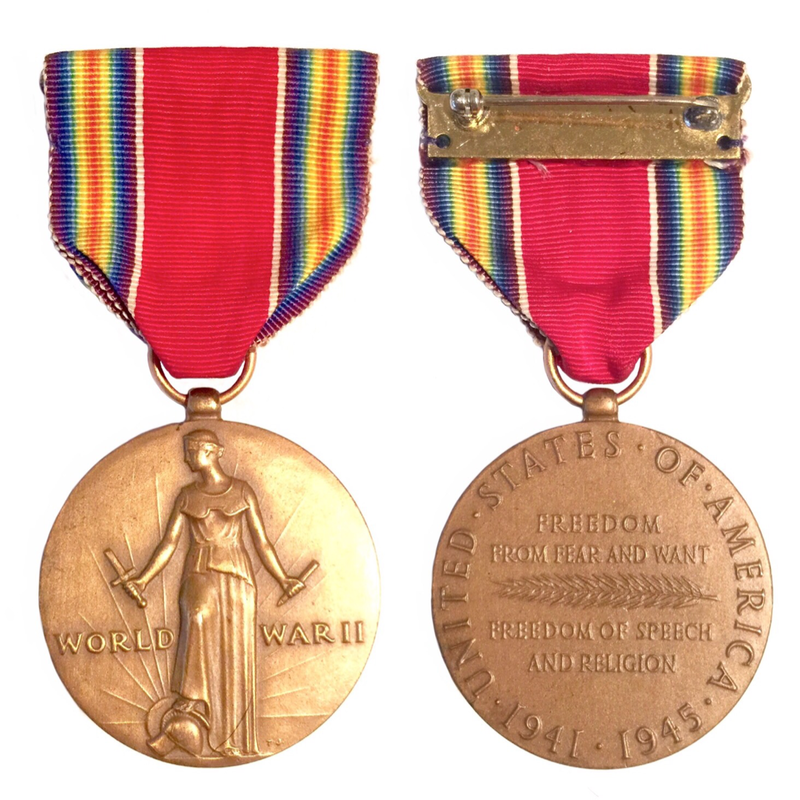 During WWII Adams served with Company C, 1/8 Marines andHeadquarters and Support and Weapons Company, 8th Marines. 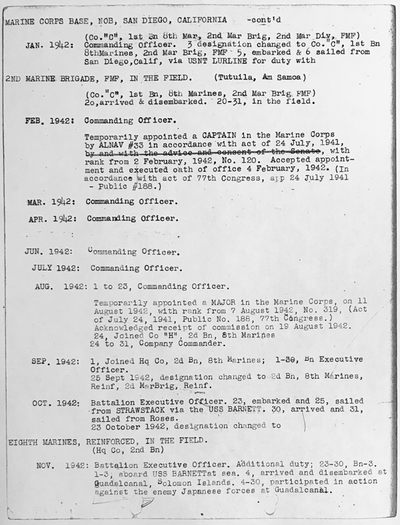 CDR 3/8 Marines in Jan 1944. 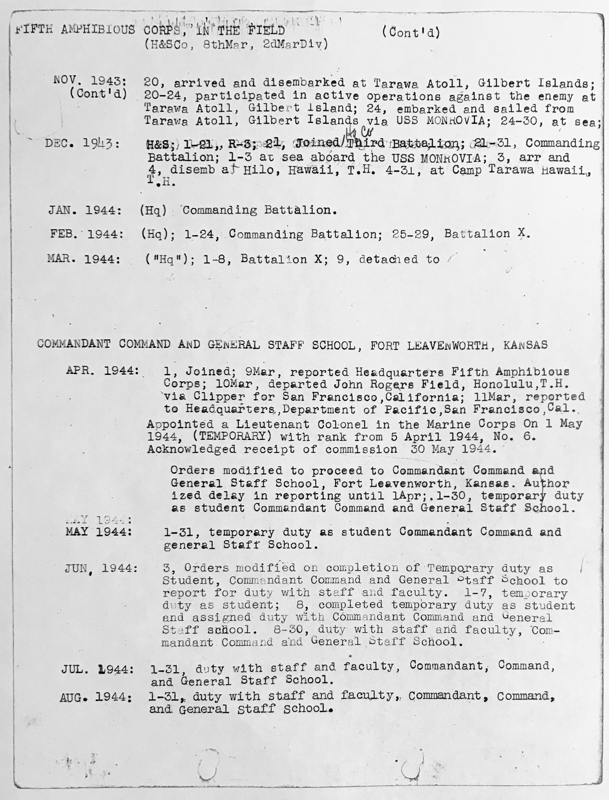 In April 1944 he reported to Ft. Levenworth, KS and attended the Army’s Command and General Staff School. 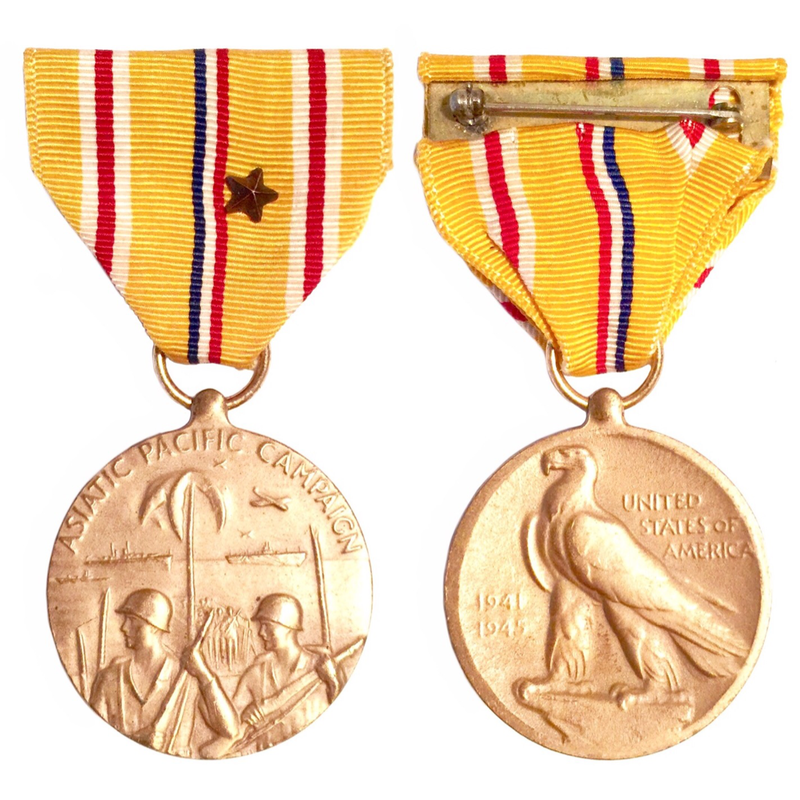 From May 1945 to Dec 45 Lt. Col. Adams commanded H&C Co. 3rdEngBn/3rdMarDiv on Guam, qualifying him for a second award of the China Service Medal. 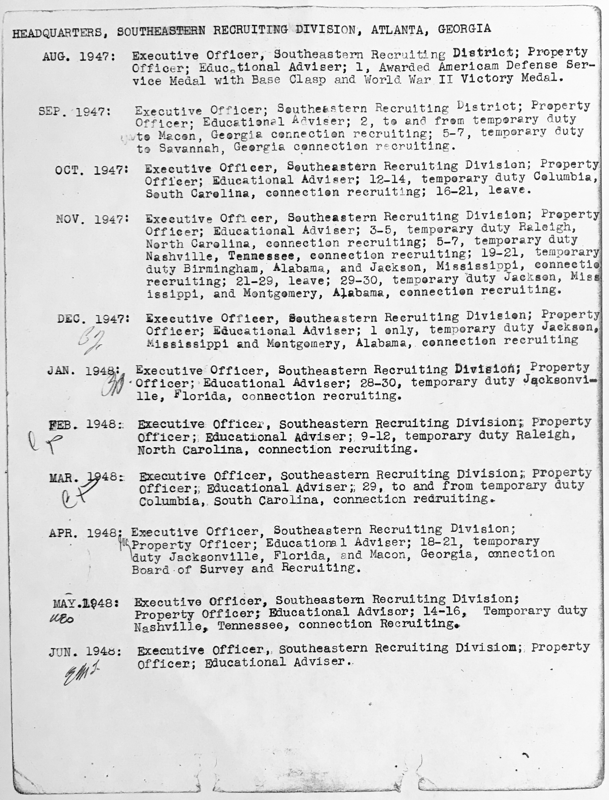 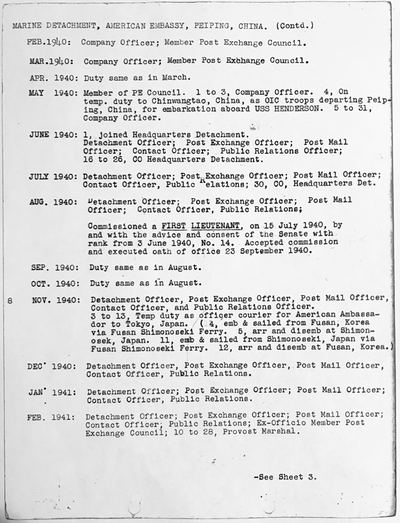 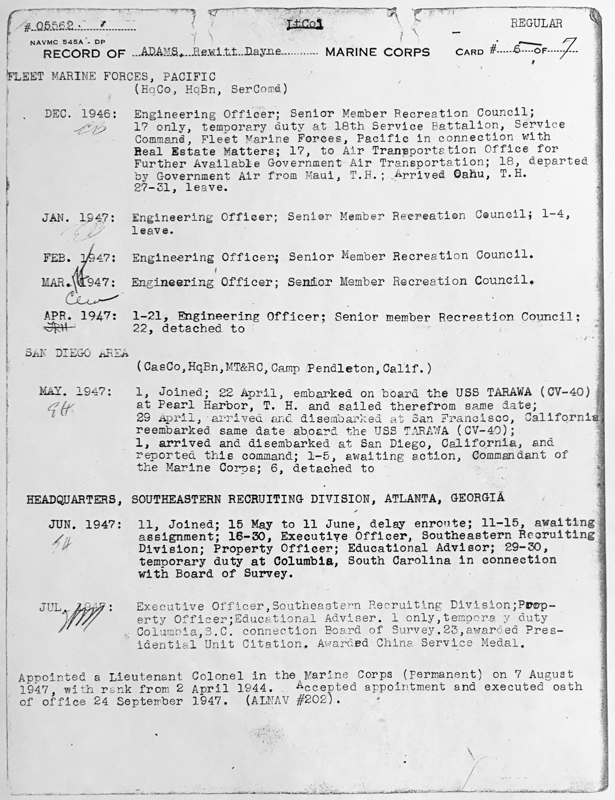 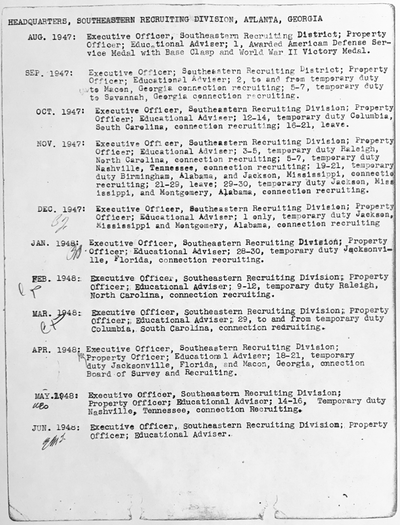 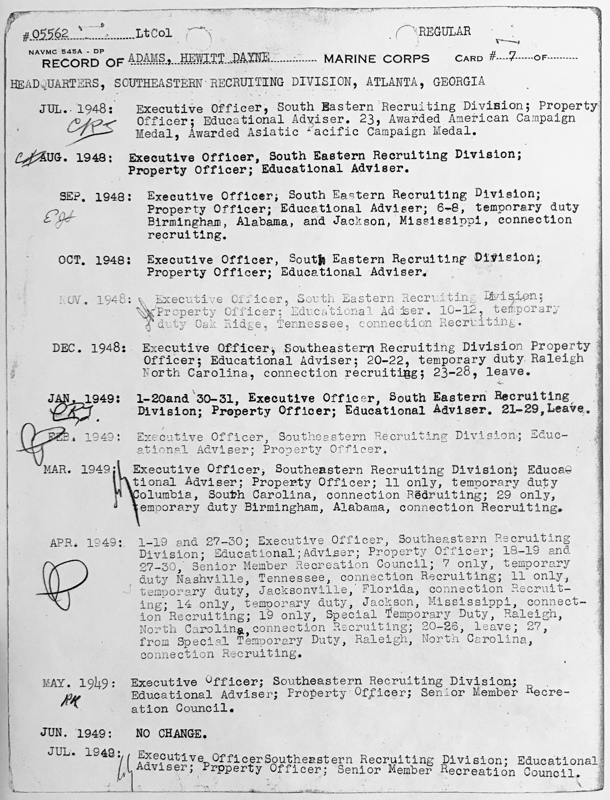 From 1947 to 1952 he held various state-side assignments. 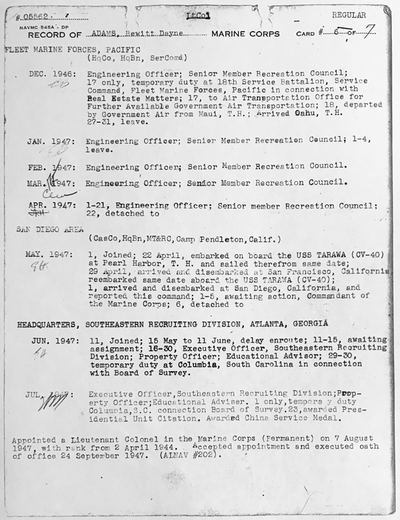 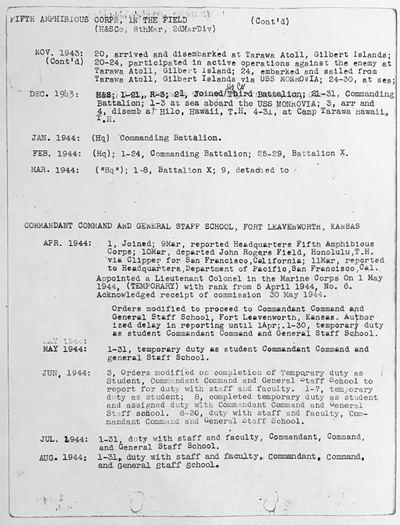 During the Korean War Colonel Adams held several assignments with the 1st Marine Division and was wounded in action on 4 March 1953. 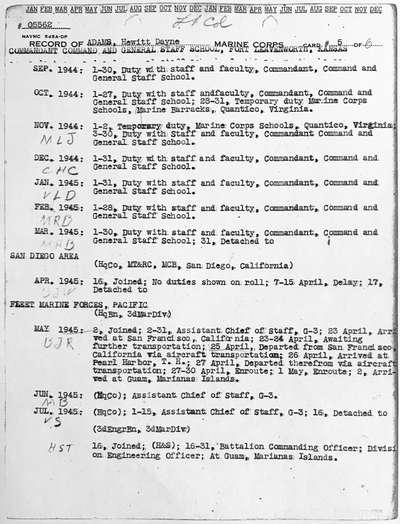 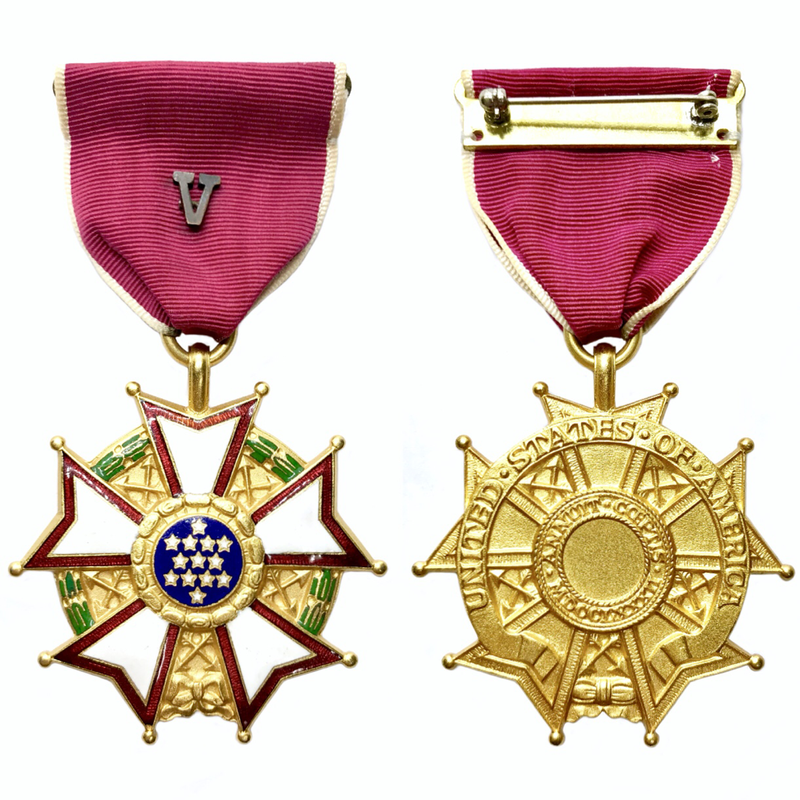 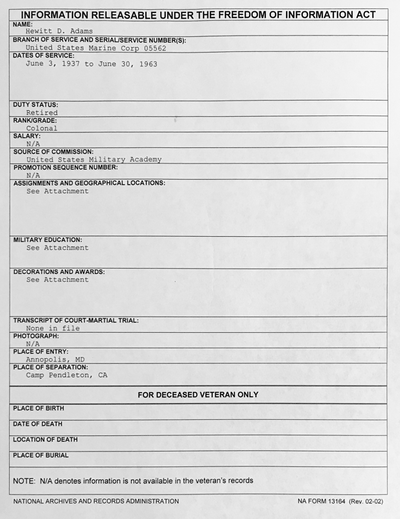 Following his return to the States in 1953 he served the remainder of his career in various assignments with HQMC, FMF PAC, and at Camp Pendleton. 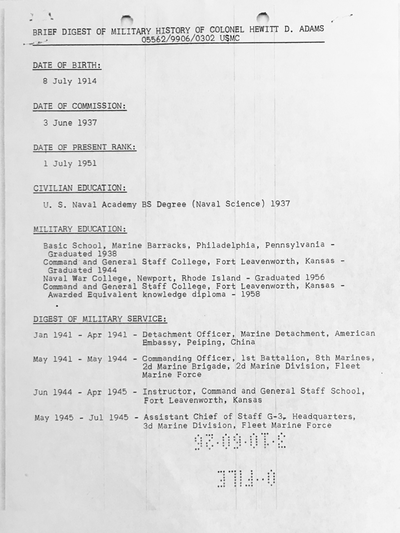 After his retirement in 1961 Colonel Adams pursued a career in academia. 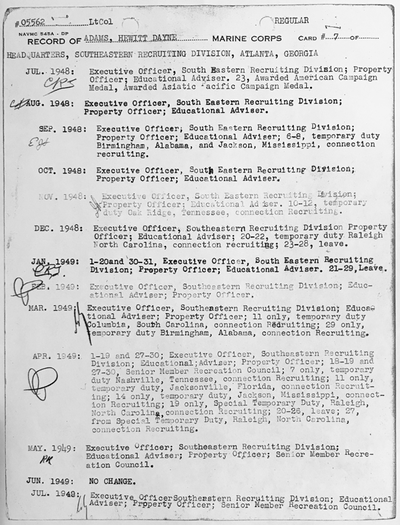 Hired as a history instructor at Clemson University in 1965, he taught Asian and military history. 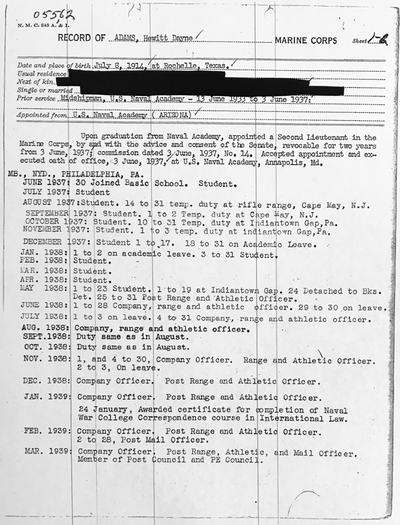 He retired as a Professor of History in the late ‘70s. 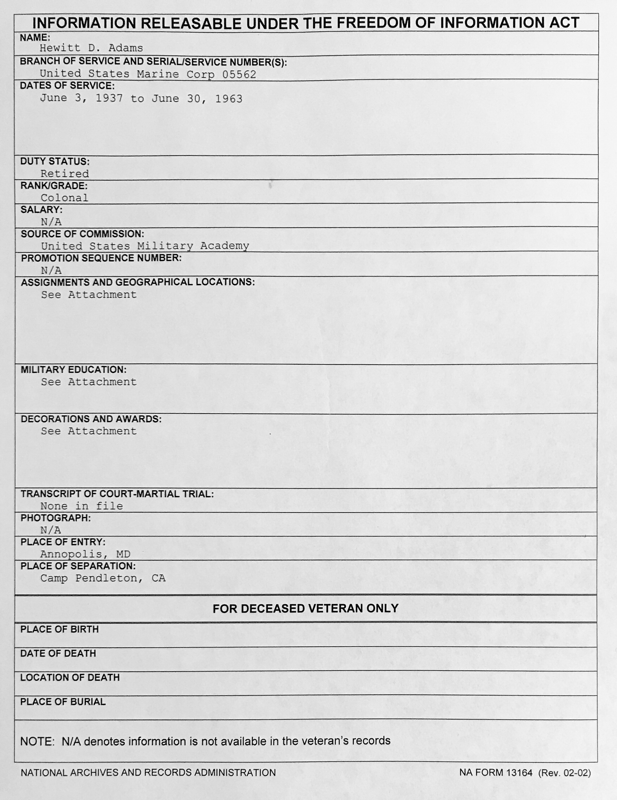 Married Mae Hee Yum in 1962 in California but also a record of same marriage in Nevada in 1963. 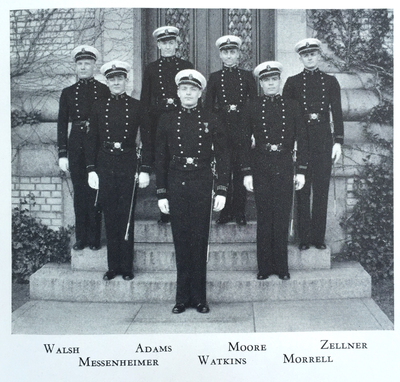 Colonel Adams died on 17 February 2003 and is buried at the USNA Cemetery at Annapolis, Maryland.